Amazon’s 8th generation Kindle is priced similar to other entry-level e-readers but what makes it, in my opinion, the best budget e-reader is its refined operating system. The device itself is very capable and there is no skimping on performance. The compromise is in the absence of a front-light and a lower 167 dpi E-Ink Pearl display. 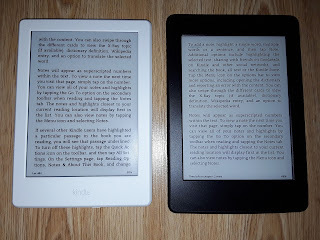 Compared to the Kindle Paperwhite there is a clear difference in clarity and sharpness; however, there is an upside with the lower resolution with the entry Kindle's better text scaling (clarified below). The E-Ink Pearl screen itself has good contrast and is superior to, for example, the previous generation of the Icarus XL with its E-Ink Pearl screen. Further, fonts are given more weight, to appear darker, and off-set the lower resolution. 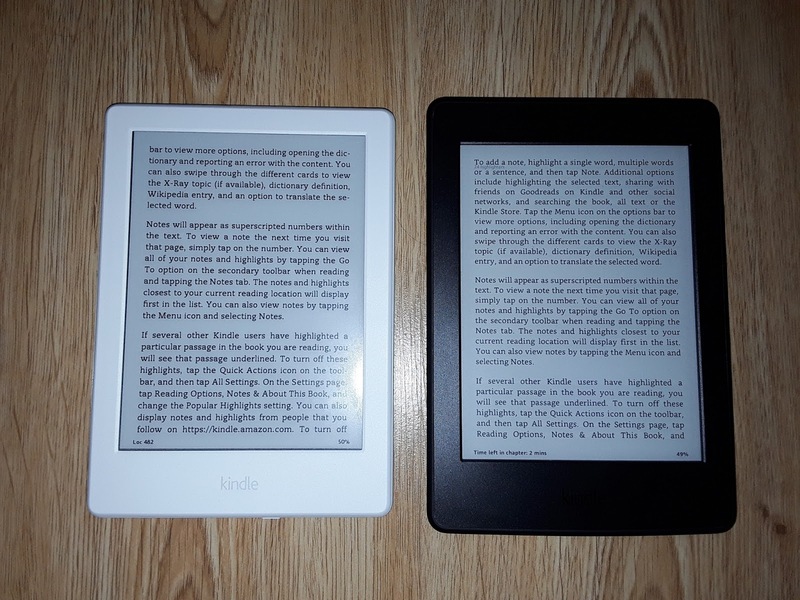 The absence of a front-light, for some users, might be a deal-breaker; if that is the case then the Paperwhite – the overall choice six-inch e-reader – would be the better option. Personally I find the absence of a front-light a non-issue, as zero light emission is the primary reason I choose to read on E-Ink screens. Front-lights, in e-readers, still generate less eye strain compared to back-lit LCD screens and are useful in low-lit environments. What I prefer in the entry Kindle is the superior text scaling, compared to the higher-resolution Kindle models. It seems the higher dpi of the Paperwhite means more text appears on the screen for each font level. However, the Paperwhite's scaling is problematic in that the difference between each font size level is too high. Thus, the third level is too small but increase the size to four and it is too large; this is a signifiant issue with the limited screen estate of a six inch e-reader. 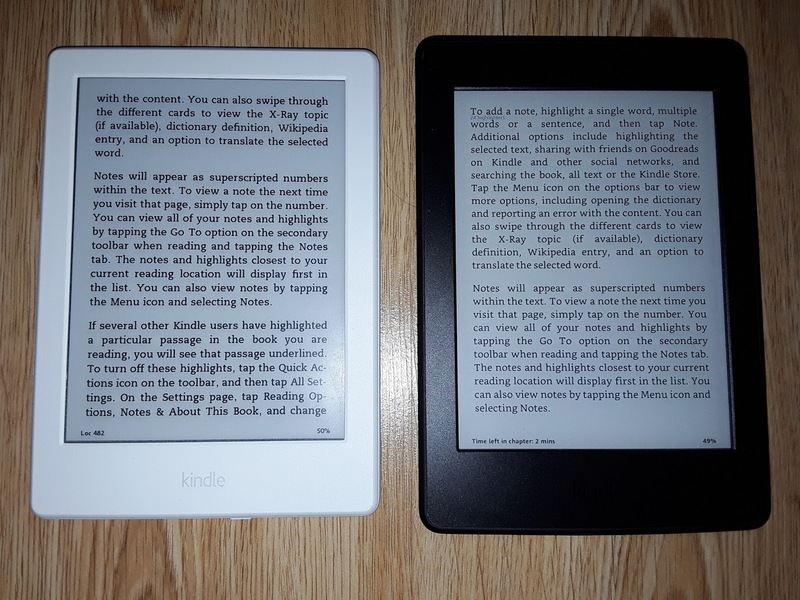 In comparison, the entry Kindle’s size increase is more balanced – level three is a balanced medium setting that works well (see picture below for font scaling comparison between the Kindle and Kindle Paperwhite). As will be clarified below, in regard to software, this issue may be resolved by providing the end-user with greater control over reader settings. Finally, another positive, is the device’s light-weight compared to the Paperwhite; the device’s light-weight (161 grams) makes it ideal for one-handed reading. There is no way to organise content in collections through folders created on the device’s local storage. Further, for a personal document to be stored in the cloud and synced across devices, it needs to be sent to the user’s designated Kindle email. Greater flexibility and integration between local storage, device collections and cloud synchronisation would simplify the process of organising user content. There is limited control over text; in comparison, Kobo’s operating system (Nickel) provides superior features. Nickel gives the user greater control over font size, text alignment, margins, line spacing and the further option to side-load fonts. For example, expanding reader settings features might resolve the problem of scaling that comes with a higher dpi screen. One possibility might be to allow the user the option to increase font size by selecting an exact font number (Android e-reading applications, e.g. Moon+ Reader and Bookari, support this feature). Greater control over reading settings and a the absence of a larger Kindle, in my opinion, are the two central issues that Amazon needs to change. An odd quirk with Amazon’s Kindle software is the extension of selected reading settings from one document to another. Thus, settings selected in one e-book/PDF document is then applied to the next document opened. For example, change screen orientation to landscape, to read a PDF document, and the same orientation is applied in the next e-book opened. It is a small issue but there is no reason why this problem should persist. There is no page number support; instead, there is location number or percentage of book read. Again, Nickel is better in this area; Kobo allows the user to display page number in reference to the current chapter or entire book. Good PDF support – Both Barnes & Noble and Kobo e-readers offer poor PDF support. Amazon’s Kindle software, in contrast, does consider PDF reading and allows the user to highlight text, annotate, look up definitions, write notes and search in a PDF file. The only problem is that there is no Kindle model beyond six inches to optimise the different use-cases of these features (seven inch is the minimum size to read PDF documents comfortably in landscape mode). Exporting notes and highlights – Amazon allows users to export their annotations and highlights for both Kindle e-books and personal e-books. There is further control on the format of the notes and highlights exported (citation styles include APA, Chicago Style, MLA or none). The exported document produced even categorises the annotations and highlights in reference to e-book location and categorises the output in its relevant chapter and section. Touch response is excellent; this applies both to the user interacting with menus/settings and highlighting. Sync support for non-Amazon personal documents – Amazon synchronises personal e-book if they are emailed to the Amazon cloud; this means notes and highlights are available across devices and may be exported via a Fire tablet or Kindle application. Vocabulary builder – Look-up words and they are then archived for later access; this feature and Word Wise (Word Wise provides simple definitions for potentially difficult words) are useful for learning. Wikipedia support – If WiFi is turned on the user is able to select a key term and look up it in Wikipedia.